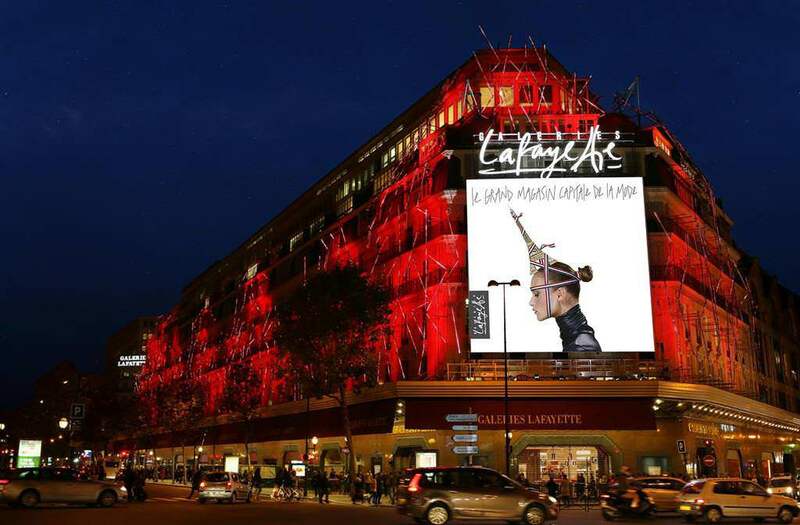 Nothing says love like shopping in Paris, and February happens to be the month for shopping lovers at Galeries Lafayette. The largest department store in Paris, February is the season for the best deals on French fashion. Don’t worry, though, if you can’t jump up and go — the deals heat up again in the summer months. The 120-year-old family business flagship store off Boulevard Haussmann is a top destination spot for Paris travelers year after year, second only to the Eiffel Tower. With 3500 brands, the halls of Lafayette Paris contain a new men’s department and a new 3,500 square meter lingerie department. It’s not all shopping, though. Just to see the Neo-byzantine style stain glass windows and the 1912 dome roof, the design and history of the building is impressive itself. And from its beginning, the store was a leader in innovation and in bringing design to the masses. Théophile Bader created a “luxury bazaar” feel in its original layout and also set the pace for leading in strategies to stay up to date with constantly changing trends and taste. And that innovation is still strong. The store just won Best International Retailer of the Year, again, by the National Retail Federation in New York last month, making any shopping trip incomplete without a visit to Lafayette. After soaking in the beauty of the window displays, with arrangements through your travel advisor, visit the VIP welcome desk to gain access to lounge areas, a personal shopper to arrange tax registration, carry bags, and advise. The welcome kit includes vouchers for a complimentary glass of champagne, a 10% discount access card, Paris Guide Map and reserved seats to the Friday Fashion Show. The Fashion Show is at 3 p.m. every Friday in the Salon Opera on the 7th floor and showcases the latest trends in French brands. It is a popular free event but requires reservation. From there, be escorted by your personal shopper to find the styles and brands in the show. Then end the afternoon with a sunset panoramic view of Paris from the rooftop terrace restaurant. For a history of the building and business, a 45-minute tour can be arranged free of charge. 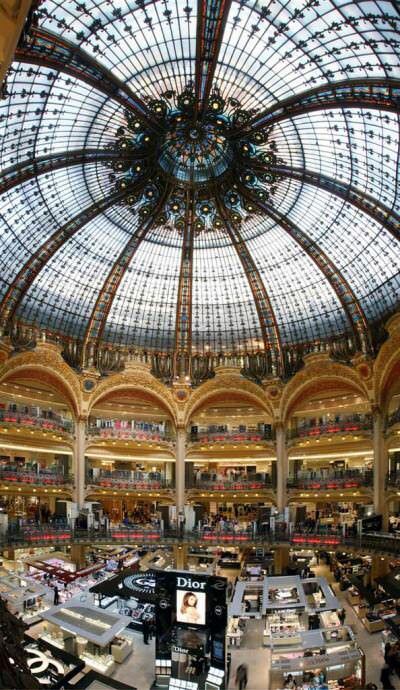 Read more on the Galeries Lafayette here. The European outlet shopping experience really shouldn’t be overlooked by luxury travelers. Theses villages are not malls as experienced in the U.S. Their design is devoted to the upscale traveler, creating an ultimate shopping day, one of the top three things chosen by travelers planning a trip to Paris. The Village has 90 boutiques including Armani, Jimmy Choo, Moncler, and other local and global luxury brand names unique to France, with only authentic last season items at the expected outlet discount rate. The Village shopping experience includes the additional value of easy tax free service for non-European residents. Your advisor can access VIP services to the Village which includes additional discounts, personal shopper service, or chauffeur from your Paris hotel. For a full day, your advisor can arrange a tour to one of the Champagne cellars nearby. Check out: The Chic Outlet Shopping App connects you to the shops to easily explore all options and is a must when planning a day at any of the 11 luxury shopping villages in Europe and China. Read more on Valleé Village. Your advisor can help you plan a day of vintage Chanel or Hérmes hunting where consignment shops are trending or even some spots only the locals go. Just ask. In the Know: Where to Stay? Esprit Saint Germain feels like a private residence, with 28 rooms on the Left Bank just a 10 minute car ride from Galeries Lafayette. Your advisor can set up special hotel offers including complimentary wine, cheese and baguette, upgrade on arrival, daily full breakfast, and early/late check-in. When you stay, stop in the living room for the complimentary cocktails and fireplace and a walk to the Gerard Mulot for their world famous macaroons just around the corner. For a bit more grandeur, stay at the recently renovated Le Bristol. Coffee in the gardens is an incredible experience not to be missed as well as the three-Michelin star restaurant, Epicure. When you book with us, guests receive upgrade upon arrival, daily full breakfast, early/late check-in, and a $100 spa credit. A bit closer to Galeries Lafayette, Le Bristol is family friendly with a children’s program, offers some of the largest rooms in Paris, and has a rooftop pool. Through May 15, stay an extra 4th night for free. Steps from the Louvre and the shops on Rue de la Paix, the Park Hyatt Paris-Vendome is a great choice. Our clients can receive upgrade on arrival, daily full breakfast, complimentary air and train station transfer, $100 food and beverage credit, and early/late check-in. Or be the first to experience the restoration of The Ritz Paris, set to reopen end of 2015 after unprecedented closure for a reported $230 million overhaul that has taken more than two years. Architect Thierry Despont, who oversaw New York’s The Carlyle Hotel renovation, is increasing the suite sizes, some with terraces, while restoring furniture and interior design. Or just slip in to order cocktails made by Europe’s most famous bartender, Colin Field, in Bar Hemingway after a long shopping spree. Your West U Travel Advisor can help you start planning your perfect Paris shopping day as part of your next trip to Europe.